Earning money for perpetual travel is the long way around. The short cut is to use OPM (other people's money) to foot the bill. Why wait until you retire to travel the world? We all can live abroad; we all can travel. The secret is OPM – other people's money. Many people believe in hard work, saving money, and one day traveling the planet. 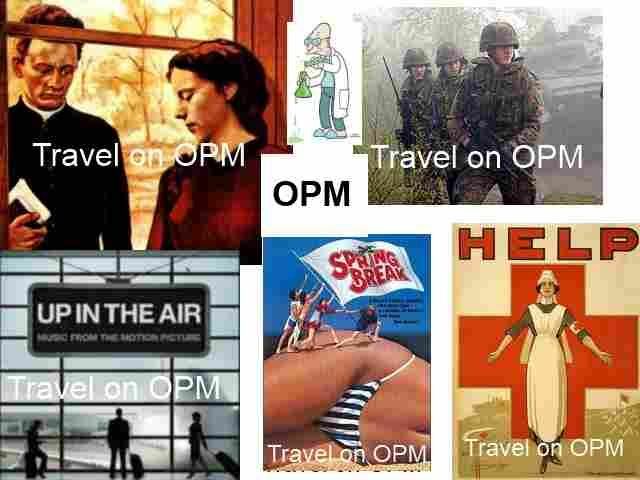 The short cut to living abroad is OPM. The Top 5 Ways to Travel Free – and a Bonus! Bonus – Last, but not least, is the military. You can join the armed services, become a solder and visit many exotic countries. Adapting is the secret. Work is the long way. Take time to think of short cuts before life has long passed you by. … OPM – other people's money … Think about it. In peace time (which was a long time ago) the military is a very good way for many to see the world on OPM. Also as a job both government and many private businesses will work but yes it does involve working at a real job but if the right job it's a good deal. Mom and dad can be a little be more difficult for some and easy for others. Grants are one of the best but usually you still have to be working at some project or another. Teachers, profs that get tenure have a very good deal but they worked for it and generally have to go traveling and do research, write, etc again as a job. But if in the long run it allows you to have enough time to travel and enjoy what you're doing it all is worth while. I got to travel 3 ways in my life, 1st as a kid with my parents. No long trips to Asia or Europe but still good, 2nd in the military and finally on OPM as a government employee (tax money) in a job I really enjoyed. Able to live and travel in other countries for over 11 years, plus a few more when in the military (not quite as enjoyable but educational never the less). What is amusing to me is how many youth grow up and say they want to see the world but never check out the various ways of doing so and never do. They get trapped by many things that if they wanted to they could avoid, but that's life. I do enjoy meeting young people on the road as most enjoy what they are doing.